Pansies with their veined, delicate petals are hard forerunners of spring. 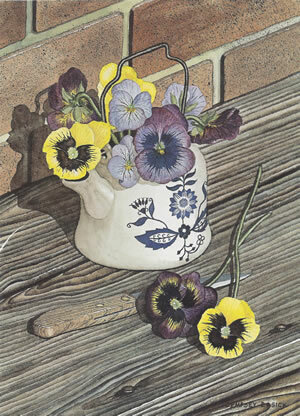 The first pansies of the year caught Dempsey’s eye and with this brush he captured their rich texture. The flowers cut from the back yard bed rest in an antique, two cup, ceramic tea that belonged to his mom. The pot sits on a little wooden stool outside the back door of the house. I love pansies and always have. If you have never grown pansies from seed you must try it. The flowers are completely different from the plants you buy. For a longer blooming season pansies from seed should be planted in a cool place and not permitted to dry out from the hot sun. They can be planted as early in March as the ground will allow. The plants will continue to flower well into June or later if the dead flower heads are picked off. 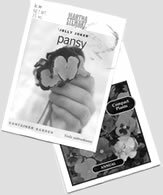 Pansies are best planted in late winter even though they are often planted in late fall.